This guide shows you how to control access to Linux instances by creating SSH keys and editing public SSH key metadata. Compute Engine automatically creates and manages SSH keys for you when you connect to instances using SSH from the Browser or the gcloud command-line tool. If you are an advanced user who needs to manage SSH keys manually, manage instance access using OS Login. If you manage your SSH keys by using OS Login on instances, metadata-based SSH key configurations on those instances are disabled. Caution: Managing SSH keys in metadata is only for advanced users who are unable to use other tools such as OS Login to manually manage SSH keys. If you manage SSH keys in metadata yourself, you risk disrupting the ability of your project members to connect to instances. Additionally, you risk allowing your instance to be accessed by users who are not part of your project. For more information, see risks of manual key management. Set a default region and zone. If you want to use the API examples in this guide, set up API access. To perform this task, you must have the following permissions. Note: You can avoid the risks of manual key management by using the OS Login API to manage your SSH keys instead of project or instance metadata. Read Managing SSH keys using the OS Login API to learn more. 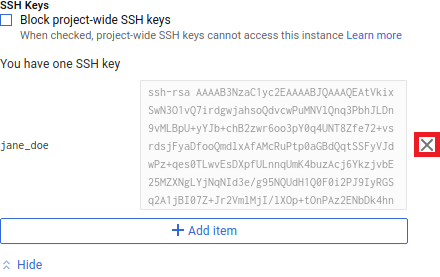 If you create and manage public SSH keys yourself through the GCP Console, the gcloud command-line tool, or the API, you must keep track of the used keys and delete the public SSH keys for users who should not have access. For example, if a team member leaves your project, remove their public SSH keys from metadata so they cannot continue to access your instances. Additionally, specifying your gcloud tool or API calls incorrectly can potentially wipe out all of the public SSH keys in your project or on your instances, which disrupts connections for your project members. If you are not sure that you want to manage your own keys, use Compute Engine tools to connect to your instances instead. By creating and managing SSH keys, you can allow users to access a Linux instance through third-party tools. A public SSH key file that is applied to instance-level metadata or project-wide metadata. A private SSH key file that the user stores on their local devices. If a user presents their private SSH key, they can use a third-party tool to connect to any instance that is configured with the matching public SSH key file, even if they are not a member of your Cloud Platform project. Therefore, you can control which instances a user can access by changing the public SSH key metadata for one or more instances. Edit metadata from your browser by using the Google Cloud Platform Console. If you prefer the command-line, use the gcloud command-line tool to edit metadata. If you are an advanced user, you can automate your public SSH key management with API methods. If you need to add users who do not have SSH keys, generate a new SSH key for each new user. If you need to add users who have existing SSH keys, locate the public SSH key file for each user. Format any public SSH keys that you want to add so they will work correctly with the tool that you will use to edit metadata. Optionally, you can also format your public SSH keys to add, edit, or remove expiration times. Edit public SSH key metadata to add or remove users from a Linux instance. Connect to your Linux instance through a third-party tool to ensure that each public SSH key is added or removed correctly. A user can only connect to an instance if their public SSH key is available to the instance through the metadata server and if they have the matching private SSH key. If you do not have an existing private SSH key file and a matching public SSH key file that you can use, generate a new SSH key. If you want to use an existing SSH key, locate the public SSH key file. On Linux or macOS workstations, you can generate a key with the ssh-keygen tool. Open a terminal on your workstation and use the ssh-keygen command to generate a new key. Specify the -C flag to add a comment with your username. [KEY_FILENAME] is the name that you want to use for your SSH key files. For example, a filename of my-ssh-key generates a private key file named my-ssh-key and a public key file named my-ssh-key.pub. [USERNAME] is the user for whom you will apply this SSH key. [KEY_VALUE] is the key value that you generated. [USERNAME] is the user that this key applies to. Restrict access to your private key so that only you can read it and nobody can write to it. where [KEY_FILENAME] is the name that you used for your SSH key files. Repeat this process for every user for who needs a new key. Then, locate the public SSH keys that you made as well as any existing public SSH keys that you want to add to a project or instance. Windows does not have a built-in tool for generating SSH keys, so you must use a third-party tool to generate SSH keys if you are on a Windows workstation. Here, we describe how to generate SSH keys with the PuTTYgen tool. Run PuTTYgen. For this example, simply run the puttygen.exe file that you downloaded. A window opens where you can configure your key-generation settings. Click Generate and follow the on-screen instructions to generate a new key. For most cases, the default parameters are fine, but you must generate keys with at least 2048 bits. When you are done generating the key, the tool displays your public key value. In the Key comment section, replace the existing text with the username of the user for whom you will apply the key. Optionally, you can enter a Key passphrase to protect your key. Click Save private key to write your private key to a file with a .ppk extension. Click Save public key to write your public key to a file for later use. Keep the PuTTYgen window open for now. Note: If you created an SSH key with PuTTYgen, the default public SSH key file will not be formatted correctly if it is opened outside of PuTTYgen. Repeat this process for every user that you need to create a key for. Then, if you have other public SSH keys for users that you want to add to a project or instance, you should locate their public SSH keys now. Otherwise, format the public SSH keys that you created. There are multiple reasons why you might need to locate an SSH key. For example, if you want to add a user's public SSH key to a project or instance, you will need access to the public key file for their key. Alternatively, you might need to locate your private SSH key file in order to connect to a Linux instance. When an SSH key is created, it is saved to a default location. The default locations and names of your public and private SSH key files depend on the tools that were used to create that key. where [KEY_FILENAME] is the filename of the SSH key, which was set when the key was created. If you need to add or remove the public SSH key from project or instance metadata, format the public SSH key file. where [PUBLIC_KEY_FILENAME] and [PRIVATE_KEY_FILENAME] are the filenames of public and private SSH keys, which were set when the key was first saved. [KEY_VALUE] is the public SSH key value. [USERNAME] is the user on the instance for whom you applied the key. Run PuTTYgen. If you do not have PuTTYgen, download and run puttygen.exe. Click Load to select and open your public SSH key file. where [USERNAME] is your username on your local workstation. To see where your public SSH keys were applied, look for the public key in your project metadata and instance metadata. If you need to add or remove the public SSH key from project or instance metadata, first format the public SSH key file. Before you can upload your public SSH keys to your project or instance metadata, you must check the format of each public SSH key file that you plan to add. Depending on which tool you will use to edit metadata, format your keys to work with the GCP Console, the gcloud command-line tool, or API methods. Optionally, you can also change your public SSH keys to add, edit, or remove an expiration time. Locate and open the public SSH key file. Check the format of the public SSH key file. [USERNAME] is the user for this SSH key, which was specified when the key was created. [EXPIRE_TIME] is a value in ISO 8601 format. For example: 2018-12-04T20:12:00+0000. If your key does not match one of the above formats or if you want to add, edit, or remove an expiration time, then follow the instructions below to format your public SSH key. Otherwise, leave the file open and add the public SSH key to project or instance metadata. Make a copy of your public key file. Use the copy with Compute Engine and keep the original file to use with your other SSH configurations. Open the copy of your public key file. Save the changes that you have made, and leave the file open. You are now ready to add the public SSH key to project or instance metadata. Optionally, you can set the expiration time for the key by deleting the second [USERNAME] and appending google-ssh to the end of the key file followed by the userName and expireOn fields in JSON. Note: To edit public SSH key metadata, you must be a project member who is a compute instance admin. If any of your instances can run as a service account, you must also be a service account user. To get permission to edit metadata, ask a project owner to add you to the project and grant you access. Project-wide public SSH keys: Use this metadata to give users general access: the ability to connect to most instances in your project. Allow or Block project-wide public SSH keys: Use this metadata value to block or allow project-wide public SSH keys on a specific instance. By default, an instance accepts all project-wide public SSH keys. Block project-wide public SSH keys if you want to restrict the instance to only users with instance-level public SSH keys. Instance-level public SSH keys: Use this metadata to give users special access: the ability to connect to a specific instance in your project, even if it blocks project-wide public SSH keys. Use project-wide public SSH keys to give users general access to a Linux instance. Project-wide public SSH keys give users access to all of the Linux instances in a project that allow project-wide public SSH keys. If an instance blocks project-wide public SSH keys, a user cannot use their project-wide public SSH key to connect to the instance unless the same public SSH key is also added to instance metadata. In the Google Cloud Platform Console, go to the metadata page for your project. Under SSH Keys, click Edit. To add a public SSH key, click Add item at the bottom of the page. This will produce a text box. Copy the contents of your public SSH key file and paste them in to the text box. Repeat this process for each public SSH key that you want to add. Repeat this process for each public SSH key that you want to remove. When you are done, click Save at the bottom of the page. Note: Setting the sshKeys metadata value on project metadata is deprecated. Use the ssh-keys metadata value instead. If instances in your project uses older images, you might need to update the guest environments for these instances. Note: The ssh-keys metadata value will not appear if your instance does not have existing project-wide public SSH keys. Alternatively, your project-wide public SSH keys might be under a deprecated sshKeys metadata value. [USERNAME_1] and [USERNAME_2] are the usernames for your existing keys. [EXISTING_KEY_VALUE_1] and [EXISTING_KEY_VALUE_2] are public key values that are already applied to your project. Note: If a public SSH key has an expiration time, that key will have a slightly different format than the keys in this example. Copy the public SSH keys. Create and open a new text file on your local workstation. In the file, create a list of all of the public SSH keys that you want to add or keep in project metadata. If you have existing project-wide keys, any keys that you do not include in your list will be removed. For example, the sample list below will remove the key for [USERNAME_1] because their SSH key has been omitted. It will also keep the SSH key for [USERNAME_2] and add the SSH key for [USERNAME_3] because their SSH keys are included in the list. [USERNAME_1],[USERNAME_2], and [USERNAME_3] are the usernames of the public SSH keys. [EXISTING_KEY_VALUE_1] is a public key value for an SSH key that you want to remove. [EXISTING_KEY_VALUE_2] is a public key value for an SSH key that you want to keep. [NEW_KEY_VALUE] is a public key value for an SSH key that you want to add. In the command prompt, use the compute project-info add-metadata command to set the project-wide ssh-keys value. Include the --metadata-from-file flag and specify the path to your list file. where [LIST_PATH] is the path to your list of public SSH keys. Note: Setting the sshKeys metadata value on project metadata is deprecated. Use the ssh-keys metadata value instead. You might need to update the guest environment in instances using older images. Add or remove project-wide public keys using the instances.setMetadata method. Use the projects.get method to obtain the metadata fingerprint value. If you want to keep your existing project-wide keys, obtain the existing ssh-keys values. "value": "[USERNAME_1]:ssh-rsa [EXISTING_KEY_VALUE_1] [USERNAME_1]\n[USERNAME_2]:ssh-rsa [EXISTING_KEY_VALUE_2] [USERNAME_2]"
[PROJECT_ID] is your unique project ID. [FINGERPRINT] is the unique ID for this specific metadata configuration, which prevents you from accidentally overwriting concurrent changes. Create a list of all of the public SSH keys that you want to add or keep in project-wide metadata. If you currently have public SSH keys in project-wide metadata, any keys that you do not include in your list will be removed. For this example, the file contains a new [KEY_VALUE] followed by one of the existing key values that you obtained in the previous step. The [EXISTING_KEY_VALUE_1] is left out, so it will be removed from the instance in the next step. Use \n characters to separate each key value. [USERNAME_1], [USERNAME_2], and [USERNAME_3] are the username for your keys. Use the projects.setcommoninstancemetadata method to set the project-wide ssh-keys value. Include the fingerprint value, which ensures that you do not overwrite any concurrent changes to this metadata value. "value": "[USERNAME_3]:ssh-rsa [NEW_KEY_VALUE] [USERNAME_3]\n[USERNAME_2]:ssh-rsa [EXISTING_KEY_VALUE_2] [USERNAME_2]"
[USERNAME_1], [USERNAME_2], and [USERNAME_3] are the usernames for your keys. [FINGERPRINT] is the fingerprint that you obtained earlier with the projects.get method. When you have finished, test your changes by trying to connect to your Linux instance through third-party tools. If you encounter issues, check the metadata of the instance that you are trying to connect to. If instance-level metadata is set to block project-wide SSH keys or has a deprecated instance-only sshKeys value, the instance will ignore all project-wide SSH keys. To apply project-wide keys to an instance, make sure the instance allows project-wide public SSH keys and, if present, remove the deprecated instance-only sshKeys value from instance metadata. If you need your instance to ignore project-wide public SSH keys and use only the instance-level keys, you can block project-wide public SSH keys from the instance. This will only allow users whose public SSH key is stored in instance-level metadata to access the instance. If you want your instance to use both project-wide and instance-level public SSH keys, set the instance metadata to allow project-wide SSH keys. This will allow any user whose public SSH key is stored in project-wide or instance-level metadata to access the instance. In the Google Cloud Platform Console, go to the VM instances page. Click the name of the instance that you want to modify. Click Edit in the toolbar. Under SSH Keys, go to the Block project-wide SSH keys checkbox. To block users with project-wide SSH keys from connecting to this instance, select Block project-wide SSH keys. To allow users with project-wide SSH keys to connect to this instance, deselect Block project-wide SSH keys. where [INSTANCE_NAME] is the name of the instance that you want to block project-wide public SSH keys. where [INSTANCE_NAME] is the name of the instance that you want to allow project-wide public SSH keys. To block project-wide public SSH keys, add the block-project-ssh-keys metadata value to your instance and set it to TRUE. This metadata value blocks all project-wide keys from functioning on this instance so that only instance-level keys will work. [ZONE] is the zone where your instance is located. [INSTANCE_NAME] is the instance where you want to block project-wide keys. To allow project-wide public SSH keys, add the block-project-ssh-keys metadata value to your instance and set it to FALSE. This metadata value allows all project-wide keys (as well as instance-level keys) to function on this instance. [INSTANCE_NAME] is the instance where you want to allow project-wide keys. Instance-level public SSH keys give users access to a specific Linux instance. Users with instance-level public SSH keys can access a Linux instance even if it blocks project-wide public SSH keys. Under SSH Keys, click Show and edit. The section expands to show all of the instance-level public SSH keys. To add a public SSH key, click Add item. This will produce a text box. Copy the contents of your public SSH key file and paste them in to the text box. Repeat this process for each public SSH key that you want to add. where [INSTANCE_NAME] is the name of the instance where you need to add or remove public SSH keys. Note: The ssh-keys metadata value will not appear if your instance does not have existing instance-level public SSH keys. [EXISTING_KEY_VALUE_1] and [EXISTING_KEY_VALUE_2] are public key values that are already applied to your instance. Copy the public SSH keys under the ssh-keys metadata value. In the file, create a list of all of the public SSH keys that you want to add or keep in instance-level metadata. If you currently have public SSH keys in instance-level metadata, any keys that you do not include in your list will be removed. In the command prompt, use the compute instances add-metadata command to set the instance-only ssh-key value. Include the --metadata-from-file flag and specify the path to the public key file list that you made. [INSTANCE_NAME] is the name of the instance where you want to apply the public SSH key file. [LIST_PATH] is the path to your list of public SSH keys. Add an instance-only ssh-keys value in metadata using the instances.setMetadata method. Use the instances.get method to obtain the metadata fingerprint value to use for the request. If you want to keep your existing instance-level keys, obtain the existing ssh-keys values. [INSTANCE_NAME] is the instance where you want to edit instance-level public SSH keys. Create a list of all of the public SSH keys that you want to add or keep in instance-level metadata. If you currently have public SSH keys in instance-level metadata, any keys that you do not include in your list will be removed. Use the instances.setMetadata method to set the instance-only ssh-keys value. Include the fingerprint value, which ensures that you do not overwrite any concurrent changes to this metadata value.